« Quack Quack to the rescue! 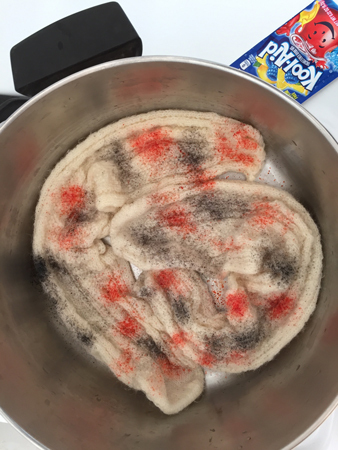 I’ve heard about dyeing with koolaid but hadn’t tried it. 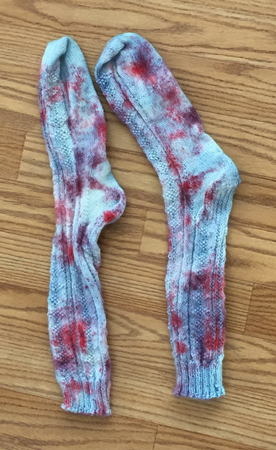 Then I read Karen’s post about speckle dyeing, and figured I’d try it on something small first. 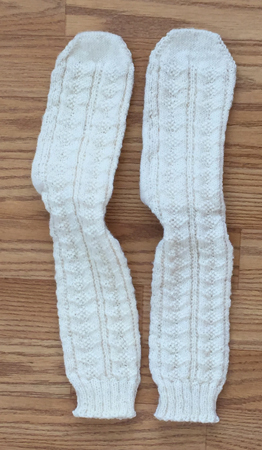 I’d recently finished knitting these socks. Very nice, but all white. So I read a bunch of online how-tos, then went to the store and got 3 packages of koolaid. Sprinkled it on from a spoon. Wasn’t crazy about how it looked in the pan, but had hopes I’d like them when it was all done. At least one of the sites I read said that it had to sit for 2 days. So in the meantime I read more directions about speckle dyeing yarn and measured out a cotton warp for 3 scarves. 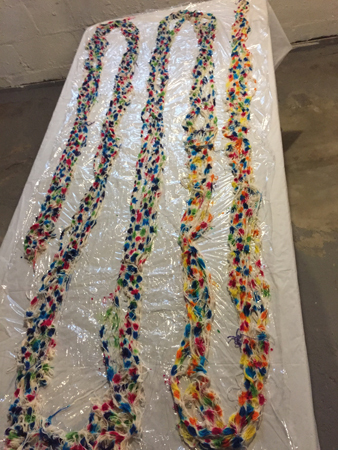 Learned my lesson about dyeing outside so am set up in my basement. Meanwhile I spoke to my dyeing teacher who strongly recommended I not do it with the dye powder for safety reasons, so I used the eye dropper technique I’d seen here. As suggested, I left plenty of white areas. Then it’s a 2 day process from here, too. Batching overnight till the next day, then sitting in water for another day. 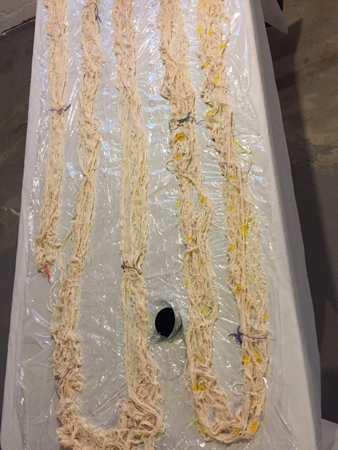 So I figured I’d do some immersion dyeing of weft yarns for the speckle-dyed warp. First time I’ve done this, too, except for with Rit dyes. 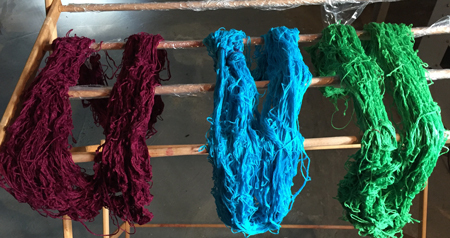 Here are the 3 skeins in their individual dye vats. 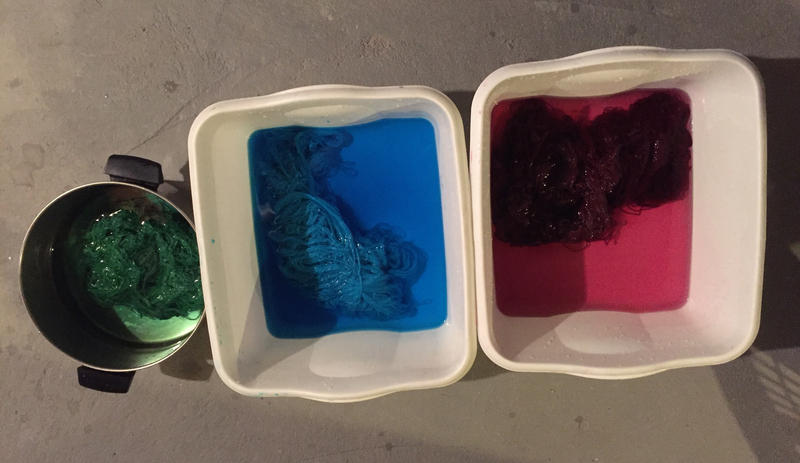 They only had to sit in the dye bath for about an hour, than overnight in water. Here they are at the end of that overnight sit. And an unlovely picture of some really lovely yarns. Very solid colors, lots of depth of color – much more than I’d intended, actually, but I love each of them. By now I could go back to the socks. Ugh. I didn’t like them at all. Looks like something from a horror movie. So I figured I’d overdye them with the blue koolaid. Even worse! Now they look ugly and dirty! Back online I went. 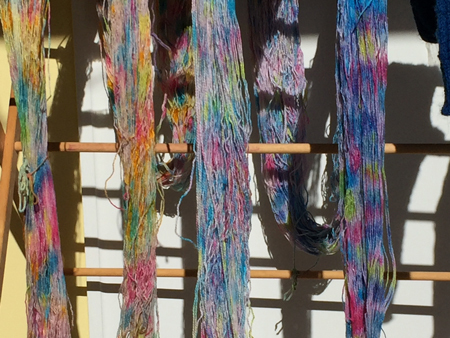 The ‘real’ dyes I have are meant for plant-based fibers (cotton, rayon, silk), not protein based fibers like my wool socks. 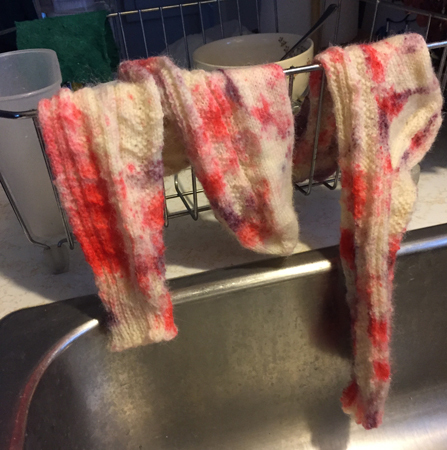 But I read how to dye wool with these dyes, and figured nothing could make them any uglier. 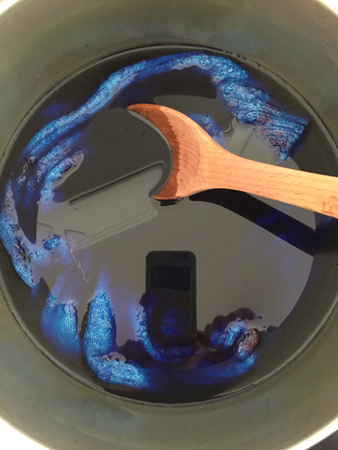 Again into blue, this time real dye and a relatively dark blue. Here’s an unlovely picture of beautiful socks (ok, sock-singular)! You can barely see the koolaid splotches, which is just fine with me. Now back to the speckle dyed warp. Oh no! There are no longer ANY undyed areas. Everything that was white is now pinky-lavender. Not what I had in mind at all. Sigh. Would I overdye this yarn? After thinking about it for a few days I decided I’d warp it. If I hated it when it went on the loom, I could always take it off dye it then. Or I could cut my losses and just toss it out. Or give it to someone as a prepared warp. 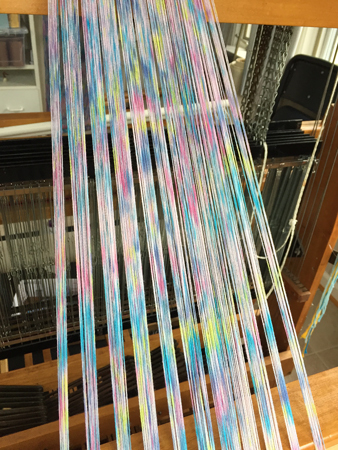 So here it is going on the loom. I don’t hate it anywhere near as much as I did in the skein, so decided I’d try weaving with it. Instead of using my beautiful immersion-dyed skeins, though, I chose a lavender cotton that would almost match the lavender in the warp, hoping it would mute everything out a bit. And it does. Looks like it’d make a nice baby wrap. Will it make a scarf anyone likes? I can’t tell yet. But I can always choose to overdye it after it’s woven, now, can’t I? You know you’re your harshest critic, right? The woven piece is lovely! I even liked the socks at a couple of different stages. I’m surprised you made them from wool. I thought we were all wool phobic? I’ll bet the speckled would have looked great with a bright white, too. Have you heard anything from your friend Theresa? I hope her crisis has eased some. Thanks, Alma. I really hated the socks with the koolaid dyes and wouldn’t have worn them, so needed to change them. I haven’t knit a pair of socks in a dogs age. Yours are lovely and I like the final dye bath best. Such a nice blue. The woven piece if pretty but I’m not a pastel kind of gal. I’m betting someone will love it though who does like those soft pretty watercolors. Theresa – I pretty much always have a sock on my needles. They’re so portable, so practical, so relatively quick to make, so good for something to do with my hands when I’m vegging out in front of the tube. I agree, the final blue is lovely. 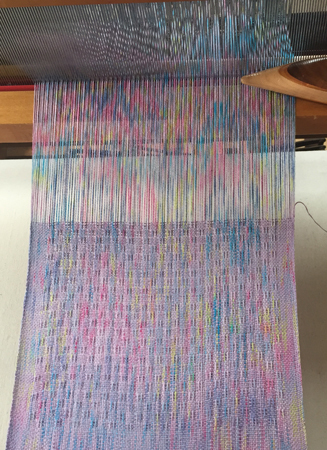 I’ve just finished the weaving on that warp….we’ll see if I like it after I’ve fringed and wet finished. If I need to overdye, I will.